The proper garage lighting allows homeowners to do their daily activities comfortably and conveniently. To get the proper garage lighting you should plan a garage lighting layout that serves all the lighting requirements your garage need. Since the garage area can be used for several functions, the garage lighting requirements may differ from one home to another. 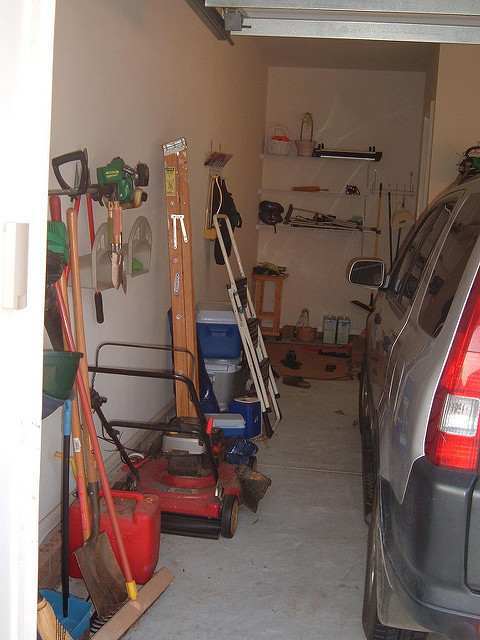 Some homeowners use the garage for car parking only, while others use it as an additional storage area or as a workshop. The types of lighting source you should use and how to place them will depend on your garage’s purpose and the required lighting layers. When planning the garage lighting layout you should first consider the ambient (general) lighting layer, which serves to illuminate the whole area of the garage evenly as possible. The most common lighting sources for this layer are the recessed lighting and the classic ceiling-mounted fluorescent lighting. Fluorescent lighting offers affordable lighting option, which has the advantages to last long, scatter light in all direction, providing a shadowless lighting, and easy to be installed. Fluorescent lighting is recommended if you are using the garage as a workshop. Unlike the fluorescent lighting tubes the recessed lighting only directs light down from the ceiling. The recessed lighting should be spaced right to effectively light your garage and give it a sleek, modern look, and will not distract to the overall purpose of the garage area. Check out How to layout recessed lighting. If you plan to use or already using the garage as a workshop or even as an additional storage, you will need to light specific areas or surfaces like a workbench. This type of lighting called task lighting and serves a specific purpose. Try to use a separate lighting switch for each task or area so, you can use it when needed. For garage task lighting you can use recessed, fluorescent, and pendant lights. Pendant or hanging lights can be the perfect solution for garage task lighting, especially in a garage with a high ceiling. Also recessed and fluorescent lighting can be used to provide light to the task surfaces. It is important to consider the outdoor lighting when planning the garage lighting layout, you can use a set of recessed lights or fluorescent lighting tubes controlled by a motion sensor switch to light the garage driveway. Recognize the function of the garage area, so you can evaluate the lighting requirements. Identify where the specific tasks will take place like the working surfaces. For a large garage, divide the garage into zones to simply control each lighting zone separately. Evaluate the cost of both lighting fixtures and the installation.